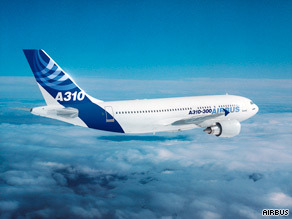 (CNN) -- The airline operating an Airbus A310-300 jet that crashed in the Indian Ocean on Tuesday with 153 people aboard was being monitored by EU authorities, according to France's transport minister. An Airbus 310 like the one pictured crashed while on the way to the capital of Comoros. Dominique Bussereau told French television that inspectors in his country had also noted several faults on the doomed Yemenia Airways plane, Agence France-Presse reported. "The company was not on the blacklist (of airlines banned from European airspace) but was being subjected to closer inspection by us and was due to soon be heard by the security committee of the European Union," Bussereau said. The Airbus A310 was inspected in France in 2007 by the French civil aviation authority and "a certain number of faults had been noted." "The plane had not since then reappeared in our country," he added. "It's more than likely to be a weather-related incident. Having said that, you cannot rule out a maintenance issue," Yates told CNN. Yemenia Air had used the jet since 1999, on about 17,300 flights, Airbus officials said. The company said it would assist in investigating the crash. "We are extremely saddened and our thoughts are with the families, friends and loved ones affected by this accident," Airbus spokeswoman Maggie Bergsma told CNN. "We are giving our maximum support and assistance to the authorities and the airline." "This includes a team of Airbus experts that will go on site and our crisis center has been open since early this morning, where our specialists work in direct contact with the airline and the authorities," Bergsma added. "The task now is to gather as much information as possible, including retrieval of the black boxes, to help us understand what happened. This will need time and patience." It is the second crash involving an Airbus jet in a month. On June 1, an Air France Airbus A330 crashed off Brazil while en route from Rio de Janeiro to Paris, France. All 228 aboard are presumed dead. The cause remains under investigation. One flight was between the United States and Brazil in May and the other between Hong Kong and Japan in June. The planes landed safely and there were no injuries or damage, according to the National Transportation Safety Board. CNN's Saad Abedine and Ayesha Durgahee contributed to this report.